Our hotel in Lombard, IL is located less than 15 miles from both O'Hare and Midway Airports and just 3 miles from the Metra. With our complimentary local shuttle you can get to the Metra and easily commute downtown in under 45 minutes. Plus you're just steps from Yorktown Center Shopping Mall featuring the very best selection of retail and activities to enjoy. 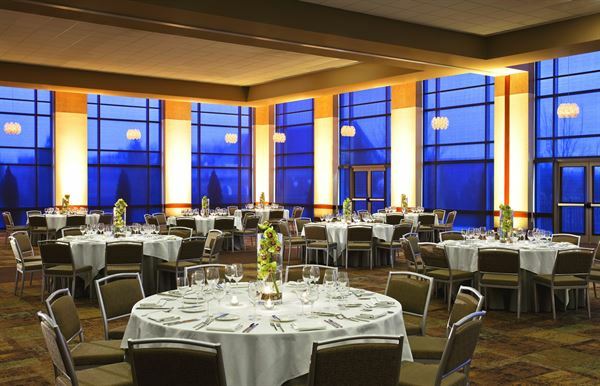 Plan an event in Lombard, with a total of 39,000 square feet of flexible meeting and event space our hotel is the perfect choice for weddings, conferences, banquets, and Lombard meetings. In addition to the 18,915 square-foot Grand Ballroom - the largest in the western suburbs - Westin Lombard Hotel boasts a junior ballroom, measuring approximately 8,125 square feet. A great package for holiday parties and corporate dinners! It includes passed hors d' oeuvres, 4 hour open bar, 4 course plated dinner, wine service with dinner and more! Our wonderful wedding package includes a 4 hour open bar, 4 course meal with custom wedding cake, passed hors d' oeuvres during cocktail hour, wine service with dinner, floor length ivory linen and more! Our Grand Ballroom is almost 19,000 square feet with the option to divide into 10 breakout rooms. It boasts 23 foot high ceilings. The Junior Ballroom is about 8,000 square feet and can be divided into 3 separate breakout spaces. The room features large floor to ceiling windows that connect to a wide outside terrace that overlooks the property's pond and fountains. The Lilac Ballroom is about 5,000 square feet with a great blank palette to create any type of event.